NABOR® Year End 2018 Market Report was Good for All! 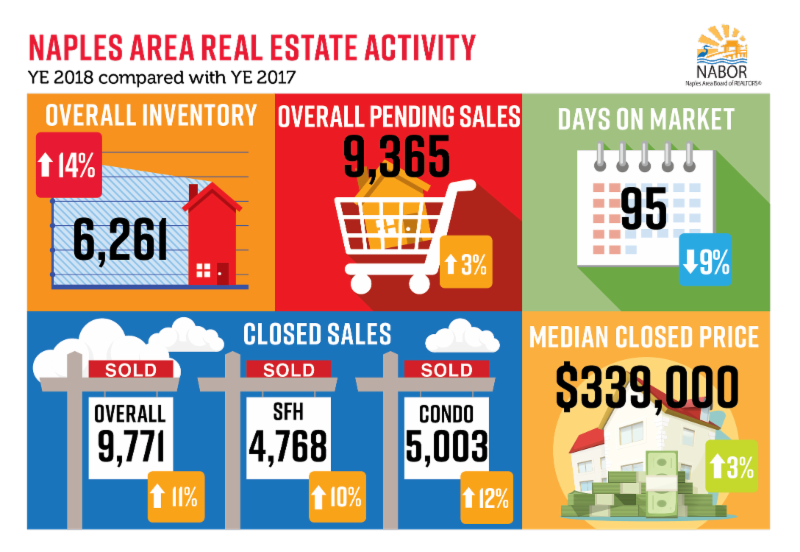 Naples, Fla. (January 18, 2019) – The Naples area housing market ended 2018 with impressive annual activity statistics in all areas of the residential real estate market including an 11 percent increase in total closed sales and a 14 percent increase in inventory compared to 2017. Sales of homes over $1 million continued to drive the market in 2018, especially in the condominium market where closed sales of condominiums over $1 million increased 37 percent! According to the Year End 2018 Market Report released by the Naples Area Board of REALTORS® (NABOR®), which tracks home listings and sales within Collier County (excluding Marco Island), inventory at the end of 2018 was the highest on record in six years. Single-family homes in the Naples Beach area (34102, 34103, 34108) reported the highest median closed price increase (14 percent) in 2018 compared to 2017. But that’s most likely due to closed sales of a few multimillion homes that took place last year including a $48.8 million transaction in June for a home in Port Royal. The median closed prices listed on NABOR®’s market reports do not reflect average sales prices. Rather, the median closed price demonstrates a rate wherein half the closed sales were purchased for amounts below the figure (median) and half the sales were purchased for prices above it. As such, of the 662 single-family homes located in the Naples Beach area that sold in 2018, the median closed price was $1,268,000 in 2018 compared to the 652 single-family homes that sold in 2017 where the median closed price was $1,117,000. Incidentally, closed sales in this area increased only 2 percent.